Are you a true meat lover? Then you must agree that there is nothing more exciting in the world than the mere thought of preparing meat recipes the right way. And what if you wish to mincemeat to make that pie just like it is available at your favorite restaurant? Well, you need to buy an efficient meat grinder for your own kitchen. And when it comes to buying one for your home, nothing can be better than the KitchenAid FGA Food Grinder Attachment. You can be absolutely sure that the next time you get hunger pangs, you can be your 5-star chef! Now, what makes this KitchenAid FGA Food Grinder Attachment so splendid? It comes with a precision blade so that every chunk of bread and meat are ground to desired consistency. The grinder is also equipped with a coarse plate to grind hard-skinned fruits and vegetables. Powerful motor makes the process fast and fun. Apart from the fine and coarse plates and the complimentary knife, every part of this grinder can be washed in the dishwasher. Comes in 3 different colors-white, black and red. The attachment is manufactured using quality materials to last long. Can also be switched into a pasta maker with the aid of a few additional attachments. Simple to setup and even simpler to use. Sausage fans can make the most of this by purchasing the sausage stuffer separately. The KitchenAid FGA Food Grinder Attachment is the perfect companion of every model of KitchenAid stands mixers. Along with meat, you can also grind various other food items easily. If you already own the KitchenAid mixer then this attachment would complement the features up to a great extent. With a Manual Meat Grinder, you would have to lead your arms through strenuous pulling and twirling to make sure the process is on. After so much of an effort, you can’t really be completely sure about the consistency of the resultant product. 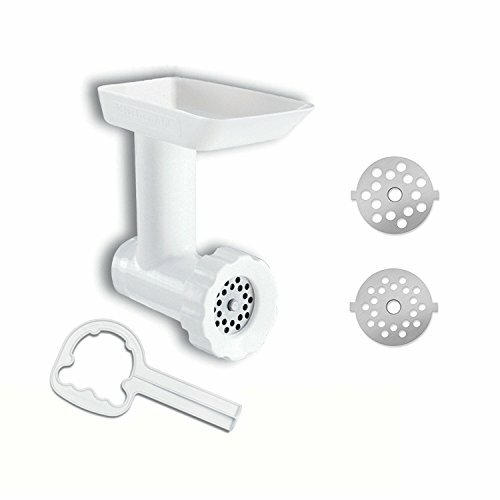 Going for a dedicated meat grinder would not be the best decision because then you have to buy additional grinders to grind vegetables and cheese. This would simply drain you of all your money! Feel the blades of the fine plates and you would perceive that these are manufactured keeping in mind the food preferences of meat maniacs like you and me! Meat cubes will also come out of this mixer minced into fine pieces just like the way you want in your burger. Needless to say, you can also make your own meatloaf without relying on chemically processed minced meat available in departmental stores. Spicy tangy bread nuggets are just 10 minutes away with this grinder attachment. Mexican delicacies like tacos are just a step away thanks to this grinder accessory. Make creamy and spicy continental dips and spreads with the fine plate to go with your meat loves and bread nuggets. If some days you are more into veggies and fruits then the coarse plate would make it possible for you. How hard-shelled the fruits or veggies may be, this attachment has got its priorities fixed. If you fancy the flavor of cheese but can’t seem to find a way out to get it ground, and then put all your hopes in this attachment, it will not let you down. Made of high-quality plastic, this attachment is lightweight as well as sturdy. And a good thing is this attachment has multiple color options available. No matter what the color is, this sports a stylish look which is sure to grab some attention of your peers. It is designed to last long if taken care of. There is more for you. Upon buying the attachment of the KitchenAid Mixer, which is one of the top mixers available you will get a number of accessories of its own as well like a knife housing, auger and 2 variants of grinding plates to name a few. Compatible with any model of KitchenAid meat grinders. Easy to use. Just plug into the power hub and you are done. Grind any food items of any texture and consistency. Two separate plates, fine and coarse to ease the process of grinding hard and soft items. Grinds multiple pounds of meat within a few minutes. Comes with a recipe book to provide assistance to your cooking sprees. Except for the grinding plates, knife and the food stomper every other part is dishwasher safe. Powerful motor handles tedious tasks like a pro. Displays versatile performance in grinding genre. From grinding frozen meat to cheese it has got your back. 1-year replacement warranty offered by the company. Only works with a KitchenAid mixer. The plastic body wouldn’t give a long-lasting performance. Food tends to get clogged inside. A bit difficult to clean the grinding plates manually. Not suitable for grinding huge chunks of meat at a time. Attachment knob might appear a bit wobbly.